Revanche was just another example of a short lived and faceless studio concept by Petrus. Petrus front man Malavasi wrote all the tracks and Petrus together with Alan Taylor wrote the lyrics. As always, Petrus took his Italian musicians and recorded the music at the Fonoprint studios in Bologna under the supervision of Maurizio Biancani that became one of the most well-used engineers of Goody Music Production. The vocal recordings however took place at Power station studios in New York. This way of splitting the music and vocal recordings were a trademark of Petrus all the way to his last efforts in 1985 even though it wasn't always appreciated by the American musicians later on in the early 80s. The fully Italian "Goody music orchestra" (not credited as that on this recording) played the music and included, besides Malavasi, Romani, Gianolio, Trevisi, Melotti and a few others. The singers however, and to some extent the writers of the lyrics, were completely recruited in US due to the language problems the Italians had as they couldn't write or sing in English. As Petrus wanted to break in USA American singers and song writers were a crucial part of that wish. One of the most brilliant female voices used on Revanche's album were Jocelyn Brown, for a short time married and credited Brown, that later gained international recognition as a background singer and success with her own solo career. Petrus also used some accomplished male vocalists like Bobby Douglas and Steve Daniels that were used now and then on several productions later on as well. 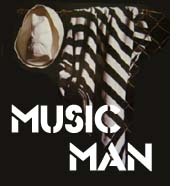 In 1979 all was set for their debut mini-album "Music man" displayed on a dark but classy cover. The set contained four tracks written by Malavasi and released on Goody music in Europe and Atlantic records in the US. The tracks were full 12" versions, a common thing at the time, for maximum sound quality. The first three tracks were similar in the sound and can be described as average Disco music heard before, good but nothing memorable, a common experience with Peter Jacques band's first album that same year. The last track on side B was something completely different though that stood out from the rest in any way. It was the catchy and energetic floor filler "1979 it's dancing time" with some decisive guitar and bass riffs and an aggressive refrain that became the best track of the set. It also included a nice break with a tasty saxophone solo by Trevisi. "1979 it's dancing time" is without a doubt a classic Disco track and one of Malavasi's best productions. Revanche didn't sell enought copies and the story of Revanche reached an early end despite the potential that could have flourished ever more. Petrus wanted otherwise and Revanche disappeared. In 2005 the Italian record label Fonte Records released the album on CD as a part of a box containing five Petrus/Malavasi productions. Please click on the cover below to see a complete list of songs from the record.